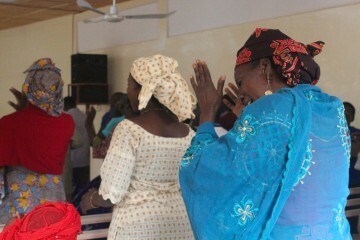 Pastors in Niger gathered together after the January attacks to worship and learn. February 21, 2016, was a day much like any other. Goats roamed the streets, shops opened their doors, and the sun shone as brilliantly as it had the morning before. Yet on this Sunday morning, one group of people had smiles just a bit bigger than normal. The Baptist Harobanda church held services for the first time in their fully-completed facility. It’s the first church building that Samaritan’s Purse has finished rebuilding since Niger saw unprecedented violence against Christians in January 2015. Around 70 churches were burned and destroyed during a two-day period. Many pastors and church members also lost their homes and possessions, and some had their lives threatened. 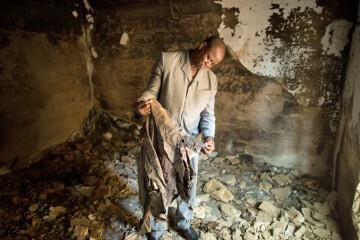 Zackariah Jadi, pastor of Salama Church in Niger, holds an burned jacket. Along with his church, his home was burned in the January attacks. It was a scary and dark time for many in the country. Satan was pressing in, trying to extinguish the light of the Gospel in Niger. However, what Satan intended for evil, God intended for good. The events have provided Samaritan’s Purse and the church in Niger opportunities to stand witness to God’s grace and mercy. The following are several accounts of how Samaritan’s Purse has been able to support churches and Christians in Niger in addition to building new facilities. Amina* lives in an eastern region of Niger. She’s a widow and mother of three young daughters. Amina’s husband left his family with a house. Knowing that Amina and her daughters are Christians, an angry mob attacked their home and burned all of their belongings during the January attacks. The small family had to flee town because the mob also wanted to take their lives. When they returned to the smoldering rubble that once was their home, Amina’s youngest daughter was filled with anger and confusion. She told Amina that she didn’t understand why she shouldn’t retaliate with violence and anger. Amina was emotionally and physically drained and had a deeply hurt family to hold together. 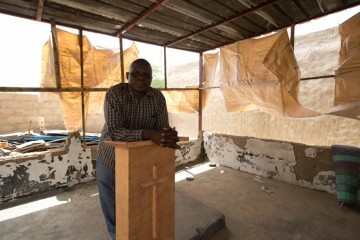 Pastor Issa Elhadjkouldjami stands at the lectern of his church in Gouré, Niger. That’s when Samaritan’s Purse met her. Ayouba, the deputy country director for Samaritan’s Purse in Niger, said that even though project staff members weren’t necessarily trained in trauma counseling, they were able to provide physical and spiritual comfort. Amina was touched that people from so far away would think of her and want to help. The team provided her family with money to help buy emergency food and clothes. Amina and her daughters could finally smile for the first time since the attacks; they could now see the body of Christ reaching out to them and caring for them. The situation prompted Samaritan’s Purse to offer training on trauma healing to pastors and leaders as they seek to help their fellow brothers and sisters recover from physical and psychological damage. 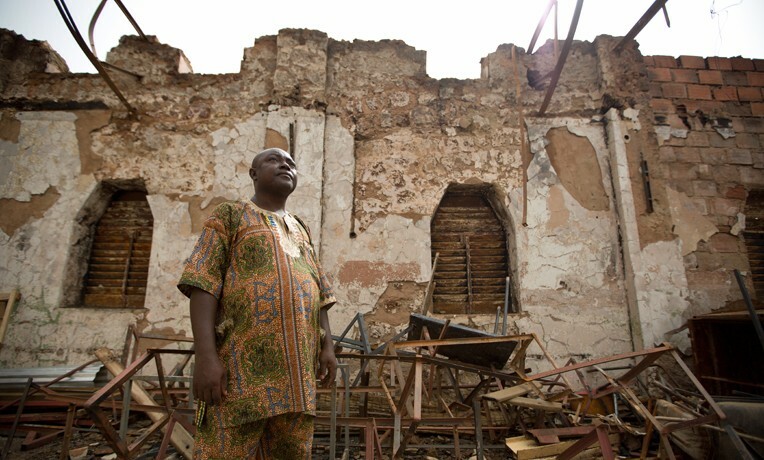 Soon after the initial aftermath of the attacks, the government of Niger conducted an assessment to record the damage done to churches. However, in remote regions, individuals’ needs were often overlooked and not recorded. This meant that many who had lost everything wouldn’t be eligible to receive government assistance. As a result, the government provided some support to the evangelists, allowing them to resume ministry activities to the villages. 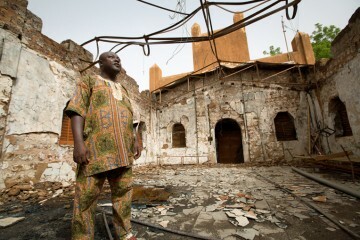 Pastor Jacques Houeto stands inside the remains of the Baptist Church at the Round Point. Before it was burned, the church was the biggest in Niamey, the capital of Niger. Prior to January events, one ministry of Samaritan’s Purse has focused on equipping church leaders through training events. Samaritan’s Purse now has the opportunity to minister directly to individual church members. The new project is providing hymnals, Bibles, and musical instruments to churches throughout Niger, assistance which will directly benefit everyone in the church. Samaritan’s Purse has also been able to offer space for churches and evangelical organizations to hold meetings. Churches across denominations and neighborhoods are now meeting and worshipping together. Ayouba said that before the attacks, the church in Niger had divisions. However, now he sees a revival happening as churches are able to come together as the unified family of Christ in response to persecution. Churches in Niger also have been renewed in ministry to their neighbors. One example that stands out for Ayouba is that of Salama Church, a new church in Niamey. During the January attacks, the pastor’s home and several motorcycles, the church’s mode of transportation, were burned. The church’s priority was to focus on the basic needs of finding a house for their pastor and resuming normal services. During the process of crisis recovery, Samaritan’s Purse was able to provide the church with two motorcycles. Indeed, this desire for ministry and mercy has stood out to both Christians and Muslims alike. Members worship for the first time inside the newly renovated Baptist Harobanda church. A particularly poignant example of the church’s witness to Muslim neighbors is recounted in the response of an important Nigerien imam. The imam explained that he had never had the chance to understand Christianity until the January attacks took place. He has been touched by the forgiveness given by Christians because he doesn’t understand how a human can truly forgive someone who harms them. Yet the Imam remains skeptical; he is waiting to see if the forgiveness he has seen exhibited is real and lasting. He predicts that if this level of forgiveness does prove to be true, many in his mosque will turn from Islam to Christianity. 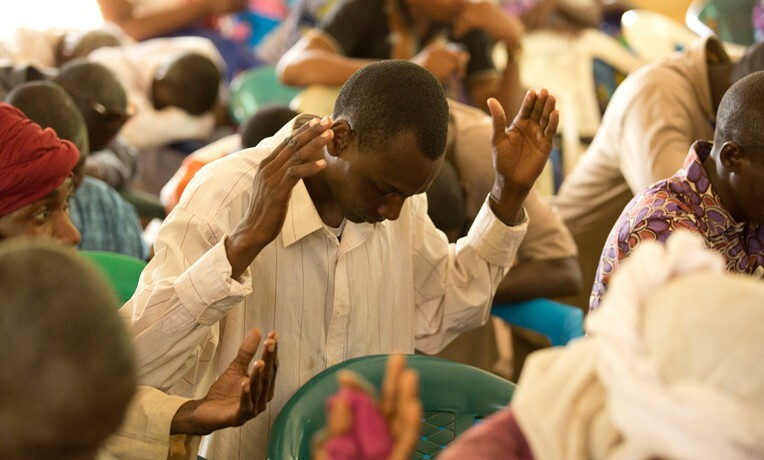 The Nigerien church is now praying fervently for people to see that the forgiveness is real, to understand that it can only come from Christ, and to turn to Christ for the ultimate forgiveness and mercy. Just as the imam shared about his lack of understanding Christianity before the attacks, many other Nigeriens are now coming to understand as well. Many Muslims now see Christianity not as a “Western” religion; they are realizing they have neighbors and family who are Christians. The people of Niger have been made more aware of the presence of Christians here, they have a better understanding of what Christians look like—ones who forgive and love—and many now feel more open to asking their Christian neighbors questions about religion. 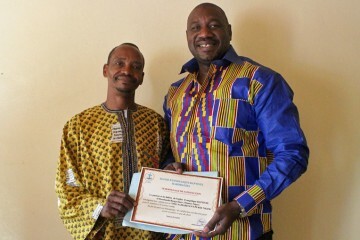 Pastor Abdurahman presents Samaritan’s Purse Ministry Program Manger Souleymane Galadi with a certificate of thanks. Ayouba shared that the church in Niger is touched and grateful that their brothers and sisters are reaching out to help them in this difficult time and want to send their greetings and love. They also encourage the global church to gather and pray and continue supporting the church here because Christians serve a mighty God who is at work in Niger. 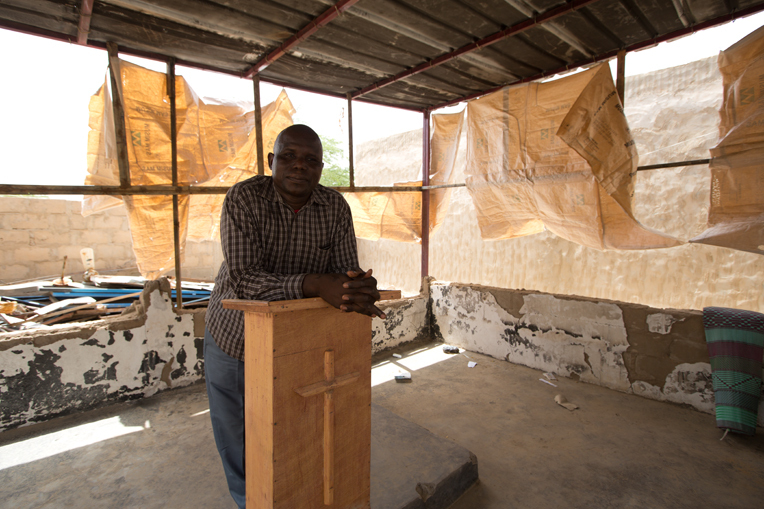 Through our project in Niger, we hope to to rebuild 38 churches during a two-year period. We’re currently working at six sites with plans to complete four more churches in the next three weeks. Niger Church Reconstruction Niger is one of the most impoverished countries in the world, and Christians here are in greater need than ever. 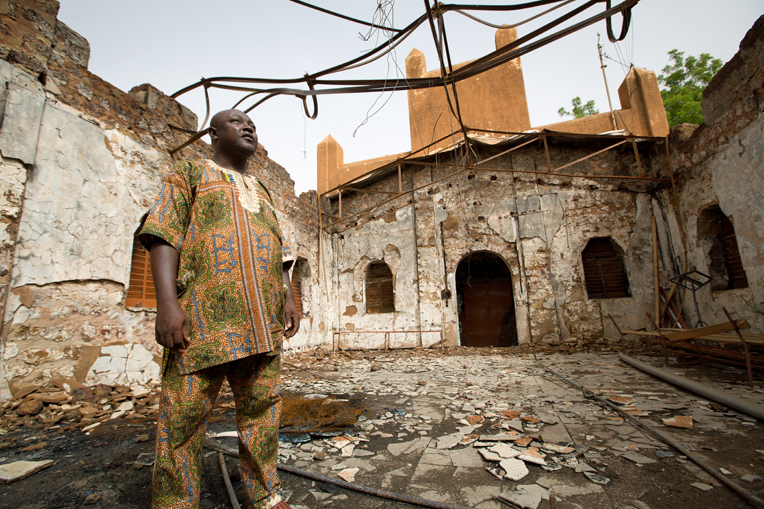 Your gift of any amount can help Nigerien believers as they struggle to rebuild churches that were destroyed in early 2015. We have already reconstructed many church buildings with many more to go. Samaritan's Purse is also helping new congregations build meeting space and providing Biblical training to pastors who have little or no theological education.